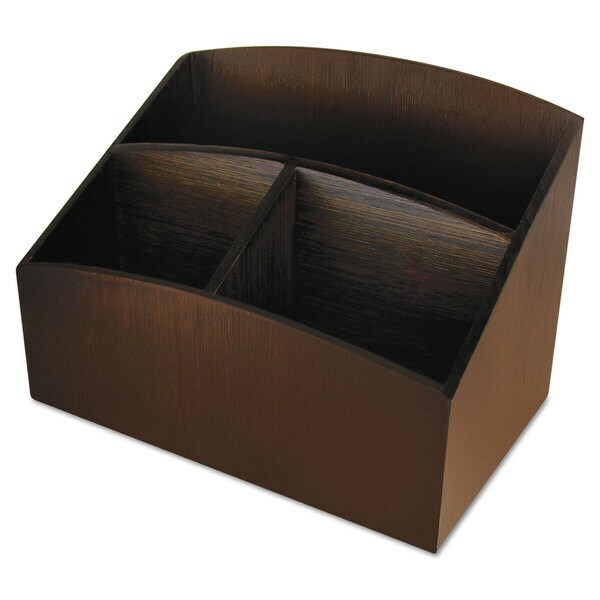 Stylish, curved design with rich espresso brown finish that highlights the attractive grain of natural bamboo. Fits into any office decor from traditional to ultra modern. Holds pens, pencils, scissors, binder clips and much more. Keeps supplies organized, and your desk free of clutter. Desktop Supplies Organizer Type: Desktop Sorter; Number of Compartments: 3; Overall Width: 7 1/4"; Overall Depth: 4 3/4". Dimensions 5 1/4 inches high x 7 1/4 inches wide x 4 3/4 inches deep.